Politics wins. Good, old-fashioned door-knocking and organizing and phone banking and precinct-walking wins. That’s the takeaway after a remarkable primary night in New York State that saw not only Governor Andrew Cuomo soar past Cynthia Nixon to re-election, but his top-of-the-ticket picks — like Lieutenant Governor Kathy Hochul and attorney general candidate Letitia James — win with relative ease. It’s also the lesson from down-ballot races, which saw most of the state senate’s breakaway Democrats — Cuomo allies known as the Independent Democratic Conference — go down in crushing defeat. It is tempting to think that politics mostly happens online, since that is where so much of the rest of life now occurs; it is where we shop and date and curate our best selves. But winning elections requires figuring out who your voters are and moving them to the polls on election day. During the closing days of the race, Zephyr Teachout looked for all the world like the next attorney general of New York. She was endorsed by the New York Times and The Nation and the Daily News, and she laid out a sharp and legalistic case about how she would use her perch to take down President Trump. But her campaign events were often her with a half-dozen other people in front of Trump Tower or some Kushner-owned building, broadcasting over Facebook Live to an online audience. James was filling union halls in Hempstead and Red Hook with hundreds of volunteers. The governor backed her, and so so did the state party, and so did the county parties and the clubs and nearly every union and nearly every elected official. At one senior center I went to in the Bronx, after James rolled the bingo wheel and gave her stump speech, an elderly woman stood up in the middle of the proceedings to ask in Spanish how they could be expected to go vote on the Thursday in question. It was no problem, replied the local council member who was there to shepherd James through the neighborhood; vans would be provided. Viral content, in other words, it wasn’t. The same dynamic played out in the governor’s race. Andrew Cuomo was running for a third term against a liberal upstart who had all the energy of #TheResistance behind her. Despite, or more likely because of her lack of experience, she flummoxed him in their one debate, forced the governor to move even further to the left, racked up celebrity endorsements, and raised a ton of money. Yet Nixon performed no better against Cuomo than Teachout did in the 2014 primary, though the law professor had no money and no endorsements. The record-high turnout — Nixon got about 181,000 more votes than Cuomo did when he won the 2014 primary election — landed like a thud as the Cuomo turnout machine matched the liberal energy that Nixon was counting on. 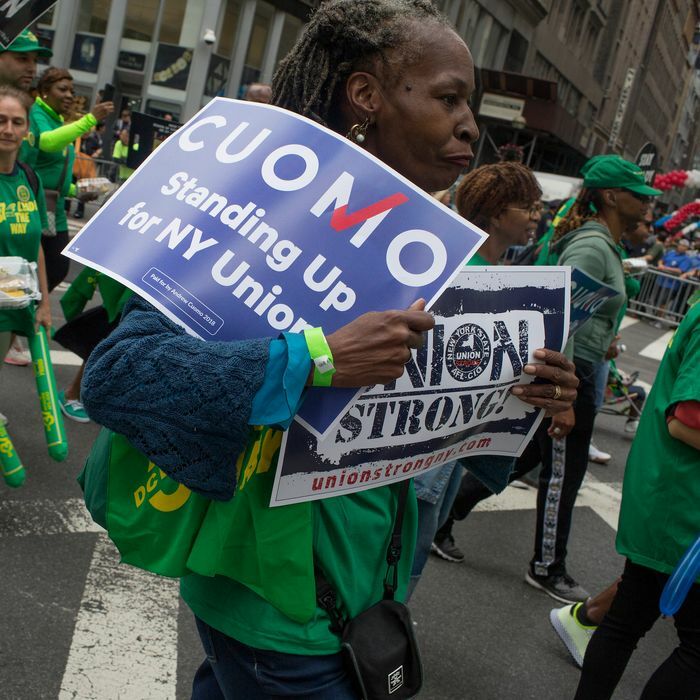 But down-ballot, even Cuomo’s vaunted political operation couldn’t match the organizing power of locals disgusted at the political gamesmanship of their representatives. Back in 2011, just as Cuomo was moving into the governor’s mansion, a handful of Democrats announced they were leaving the Democratic conference and would caucus with the Republicans. At times they handed the GOP a majority that should rightly have been the Democrats’, and at other times they padded the GOP’s advantage. He never copped to it, but it was always an arrangement widely believed to be Cuomo’s handiwork, a way to keep him from vetoing bills that came out of a Democratically controlled Senate and an even more liberal Assembly. And so earlier this year Cuomo snapped his fingers and brought the warring factions back together with the promise that the mainline Democratic senators — those who had remained Democrats — would welcome renegade senators back. They did, but it didn’t matter. Neighborhood activists threw six of the confederates out of office. Even Martin Dilan, a Democratic stalwart who faced a challenge from Julia Salazar, a Democratic Socialist with a colorful past, was defeated easily in the face of determined door-knocking. What happens in the next two months and beyond is anyone’s guess. Democrats could fail to retake the state senate. If they do triumph in November, they will likely have a narrow majority filled with first-time lawmakers determined to rip up the status quo. Cuomo is going to come back more powerful than ever, surely eyeing a presidential run and trying to figure out how to manage a fractious group of Democratic lawmakers who ran against politics-as-usual in Albany. The last decade or so of state politics has been wild, filled with Eliot Spitzer’s resignation in a prostitution scandal, David Paterson’s implosion, a legislative coup that shut down the state government, and eight years of Cuomo skulduggery designed to keep everyone in line. The pot is about to boil over, and riding the coming wave of chaos is going to require some special kind of skill.